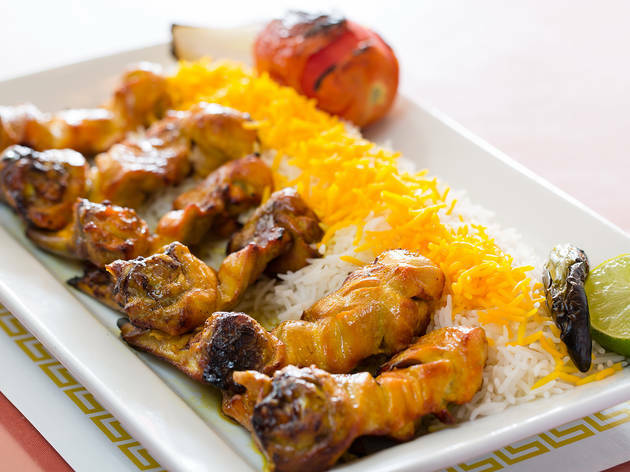 This Persian restaurant on Westwood Boulevard sprouted from a grab-and-go counter inside the adjacent Super Sun market. Farsi still has a case packed with dips, soups and rice dishes, but the owners now conceal those offerings behind high-backed banquettes. Instead, the focus is on a fashionable space with orange walls, a fiber optic chandelier, and dishes that Farsi staffers prepare to order. Chicken Bone-in with Rice ($13) consists of imaginatively butchered drumsticks, flaps of meat akimbo that are stained yellow and seared on the outside. 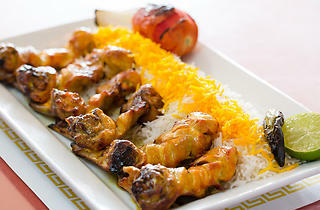 The kebabs come with saffron stained rice, grilled tomatoes, bell peppers and onions, and a squeezable lime wedge. I'm a huge fan of Persian food and Farsi cafe hit the mark! Enjoyed a beautiful 3 courses including 2 side dishes, full entree, and dessert. The homemade hummus is on point and so was the salad (on the small side compared to the other side dishes but delicious). The entree items I mostly ate was the lamb and it was beautifully cooked as it just fell off the bone in a beautiful sauce/flavor. Other people at my table had the grilled salmon and beef kabob - both fantastic! They give you a lot of rice so you'll certainly be full! The 3rd course for dessert was great and highly suggest the persian ice cream and baklava. I was familiar with baklava but had no idea what persian ice cream was. It's this fruity ice cream with nuts sandwiched between 2 wafers. The meal was fantastic and definitely recommend! Cozy Persian restaurant in Westwood. It’s a good place to bring family friends. Friday nights are actually their slow night, so come on a Friday if you want mellow, come on a Saturday or Sunday if you want it to be buzzing with people. They usually have a live singer in the corner performing songs, he can get pretty wild, which is funny since the restaurant isn’t that big. The food is good and they give a lot! The fesenjan stew is sweeter than some of the other restaurants I’ve tried, so I recommend getting that as an appertizer with tadig, rather than making it your entrée. Street parking is usually not too bad in that area. Waitstaff is very friendly here.